Transphorm Inc.—the leader in the design and manufacturing of the highest reliability and first JEDEC- and AEC-Q101 qualified gallium nitride (GaN) semiconductors—along with solar energy innovator Inergy and design partner Telcodium Inc. announced today that the upcoming Inergy Kodiak Extreme uses high-voltage GaN to reimagine what’s possible with portable power generators. The soon-to-be-released Kodiak Extreme utilizes a photovoltaic (PV) inverter and battery charger both integrating Transphorm’s JEDEC-qualified GaN platform. These power systems result in a generator that is more powerful, lighter, and quicker to charge than competitive products. And, given that GaN semiconductors run cooler than similar Silicon (Si) devices, the Kodiak Extreme does not require an internal cooling fan—allowing Inergy to develop one of the first truly water-resistant and dustproof solar power generators for consumers. The Kodiak Extreme has a 110/120 Vac 2 kW output. The generator targets consumers and professionals [construction, emergency services, industrial, etc.] by providing reliable off-grid AC power. The solar generator’s PV inverter and battery converter use Transphorm’s TP65H050WS 50 mΩ TO-247 FET and TPH3206LDGB 150 mΩ PQFN device respectively. They serve as close replacements for the Si IGBTs and MOSFETs used in prior Kodiak models given their standard packaging, which makes them easy to design in and heatsink. Transphorm’s high-quality, high-reliability GaN semiconductors can increase power density up to 40 percent and decrease heat losses through traditional heat sinking methods while switching 2x to 3x faster than Si transistors. The Gen III devices also offer ±20 V gate robustness and a 4 V threshold, decreasing the need for additional circuitry and controls to ensure reliability. The Kodiak Extreme will be unveiled at Power-Gen International 2018, giving conference attendees a preview of the industry’s first GaN-based portable solar generator. Commercial release is slated for Q1 2019. Distribution partners interested in product specifications can sign up for additional detail at https://inergytek.com/pages/kodiakextreme. 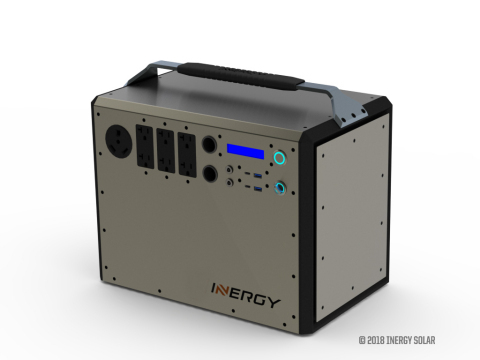 Inergy designs and manufactures the world’s smartest, portable ‘plug-and-play’ energy storage solutions—ideal for portable, on and off-grid power needs. Inergy’s power systems are typically less than half the weight and size but priced similarly as competitors giving it a substantial market advantage. Inergy is focused on creating solar-powered solutions that can go anywhere, including those places that lack power infrastructure or access to mainland resources. With investors and community support, the cleantech startup plans to be the undisputed leader of what will become a billion-dollar industry.